In this level the goal was to have a simple lake with a lot of activity and excitement. The initial pass of this level was extremely simple. The lake was a very tight feeling circular shape with no obstacles and the only movement was a small amount being provided by a waterfall. Here level was pushed out so the players could move around more freely and the forces from the waterfall were increased. The space and added movement were still not enough to motivate the players to move around the whole lake. The collectible items were being spawned in at random and with no intention. In the third pass the waterfall was eliminated and replaced with a whirlpool adding a circular force to the players, here the cyclone is not yet visually represented. Rocks were added to prevent players camping in the middle of the lake, however they make navigation quite difficult. The final level now has a river that runs through it, this makes sense of the cyclone and allows us to spawn in special pickups up stream and float them into the level so that spawning feels intentional. The cyclone is now visually represented and alternates between clockwise and counter-clockwise motion. The lakes shore line has been expanded to accomodate the rocks and current so the players controls feel more comfortable. In this level the goal was a level that felt a little slower and more methodical with more space to explore. This level I took over mid-development. The tree obstacles in this level were so tall that players were losing their characters behind them. Where the cat tails and lily pads had no effect on the player movement. The oblong shape of the level and the object placement was making it so players were getting stuck in between obstacles and invisible walls. The tree obstacles that were blocking players were swapped out for stump assets so they still have the same functionality, but no longer block the player view. The areas of water that are covered in lily pads and cat tails now slow the player down. 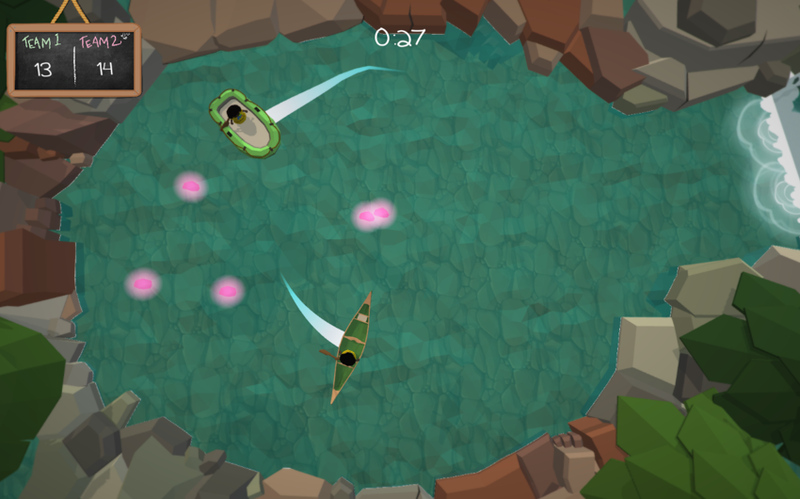 The obstacles that were getting player stuck have been moved closer to the center of the lake or pushed out to the shore line. To keep the players in the game and minimize menus and word on the screen I wanted to integrate the level selection and a tutorial of sorts. In order to do that the level select was treated very much like a level. 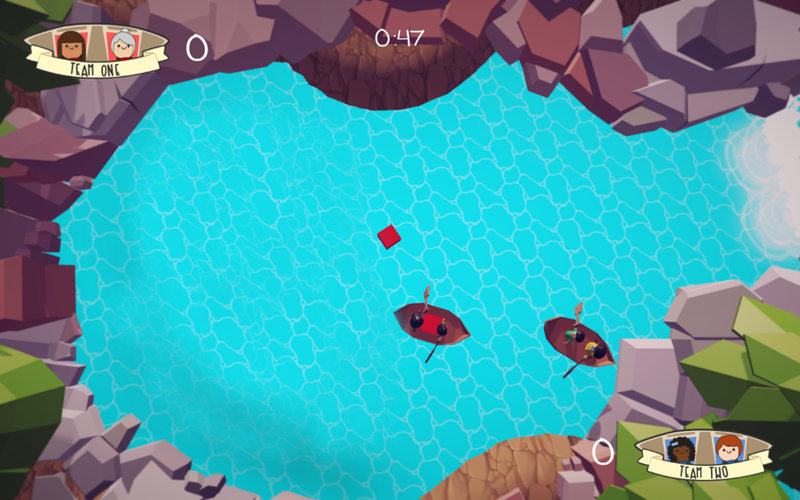 The players are in their boats and must paddle both boats into the same river in order to load one of the levels. This gives the players an opportunity to become comfortable with the controls before being put into a competetive and potentially rowdy lake.